Cut the cabbage in half lengthwise, then crosswise into 2-inch pieces, discarding the root end. Place in a large bowl, sprinkle with the salt, and toss with your hands until the cabbage is coated. Leave to brine for an hour. Spoon cabbage into a in a colander that’s been placed in the sink. Rinse with cold water. Gently squeeze out the excess liquid. Place the remaining ingredients in a large bowl and stir to combine. Add the cabbage and toss with your hands until evenly combined and the cabbage is thoroughly coated with the mixture. Pack the mixture tightly into a clean glass jar with a tight fitting lid and seal the jar. Let sit in a cool, dark place for 24 hours (the mixture may bubble). Open the jar to let the gases escape, then reseal and refrigerate at least 48 hours before eating (kimchi is best after fermenting about 1 week). Refrigerate for up to 1 month. *If you’re eating it right away, leave some aside to spoon on top of sausages. Kimchi is like a spicy crisp salad when you eat it right away. 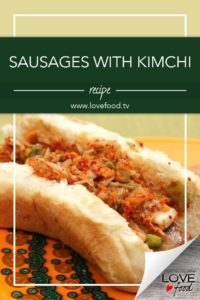 While you’re making kimchi, grill sausages and top with kimchi!